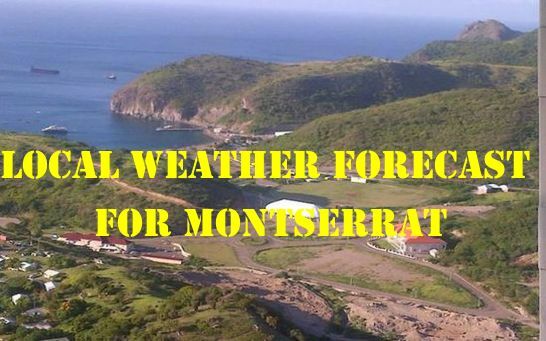 SYNOPSIS: Weak moisture along with a moderate to fresh trade wind flow ahead of Tropical Storm Kirk will maintain a moderate chance for shower activity over and around the islands today and tonight. WEATHER TODAY: Partly cloudy skies with a 40 percent or moderate chance for showers mainly before midday. WEATHER TONIGHT: Fair to partly cloudy skies with a 40 percent or moderate chance for overnight showers. SPECIAL WARNING: An advisory against breaking surfs and dangerous rip currents remains in effect for sea bathers at this time, and will also be in effect for small craft operators later this evening into tomorrow as Tropical Storm Kirk approaches the area.. WINDS: East-northeast at 22 to 33 km/h or 12 to 18 knots with higher gusts over open waters as well as during showers..
SEAS: Moderate to rough with significant wave heights of 1.5 to 2.4 metres or 5 to 8 feet. An advisory against breaking surfs and dangerous rip currents remains in effect for sea bathers at this time, and will also be in effect for small craft operators later this evening into tomorrow as Tropical Storm Kirk approaches the area..
Sunset today: 6:02 pm. Sunrise tomorrow: 5:59 am.